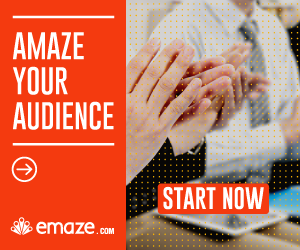 “Emaze is the new era of presentation tool, it’s an online presentation website that helps you create really high and designed presentation, engaging presentation really easily. you don’t need to has any graphic design skills because Emaze software will do everything for you. For example, you can take an existing Powerpoint presentation and transform it into an amazing presentation automatically and our software and algorithms will do all the design work for you”. Is it all online ? can you do it right from your house ? “exactly it’s all online, all the work is from the browser, you don’t need to install anything on your computer, it works on any platform, it’s a PC or laptop or desktop or tablets devices. you can also watch the presentation on mobile and you can watch the presentation on your desktop. it’s all based on html5 technology which is the technology of the web”. How is it different than other presentation tools that are on the market ? “Basically, Emaze put a lot of emphasis on the design and the ability for users to create a really high-end professional design presentation easily and also with Emaze, the user can easily collaborate and share his presentation with others. you can basically embed any widget that lives on the Internet like a YouTube movie or even a website or Twitter ticket with copy – paste the link because everything is live on on the web. Also, Emaze has really different designs than Powerpoint, for example, you can create a 3d presentation in Emaze that you actually can move in a word and basically see your slides on the walls, stuff that you cannot do we do with PowerPoint and of course the ability to automatically designs your presentation and give you guidance on how to build your presentation really good”. Who would recommend this to for ? businesses that basically have the need to create professional presentation but don’t have the resources or the capability in their companies. so freelancers and small businesses using it a lot. also, we’re very strong in the education market – students and teachers create presentations for the studies”. It sounds like a very unique idea you came up with, how did you think of it ? basically looks the same and then you have to fight on the price and then one day I had an idea, let’s come with something different and then I started to build presentations with flash you know, but it took a lot of time and a lot of coding, but when I came into the room and presented with this flash tool that we created, it was amazing you know – the customer was like oh you know – “there are different ! they are that the company that I want to work with ! ” and then I said ok we need to take it to the market, we need to take the idea of creating really engaging and amazing presentations but easily to the whole world”. Don’t know what is Emaze ? Start here !